Last Sunday, Mizuki and I flew to Los Angeles to meet her friend from Japan, Pi-chan — all of us planning to "do" California, starting in Southern California. Apology: First I must apologize to all my friends in California that I was not able to get together for a visit — my job was chauffeur and I did not control the schedule. Maybe next time. 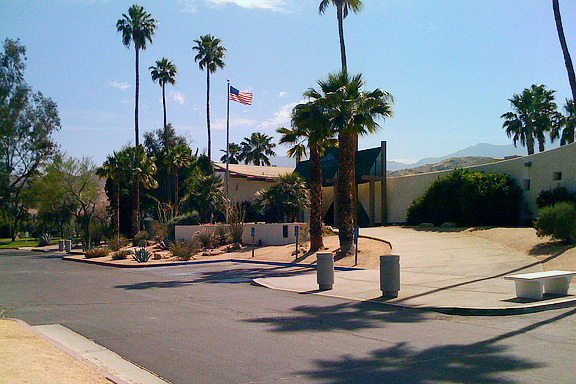 First	stop	was	Palm	Springs to visit the Desert Hills Factory Outlet Mall — for shopping! The plan was for two days of shopping. Since I can only tolerate a couple hours of shopping, I decided to find something else to do. I asked at our hotel (a nice little boutique hotel by the name of 7 Springs Inn & Suites) and they suggested Tahquitz Creek Golf Course. There are two courses there — the Legend and the Resort Course. I played the latter. I was paired with a couple and their friend, all from Canada and we had a lovely time playing together. Fortunately, they had played this course before and Ted was able to give me tips on aiming points, etc. Interestingly, this course is managed by Arnold Palmer Golf Management. According to their web site, their company goal is to strive for perfection in course condition, service standard, pace of play and player development. I cannot tell that they are significantly different from, say Troon Golf in Arizona, but the course was nice and we had a great time. One aspect that was unique at this course was that your green fee included a buffet breakfast and lunch — my first such experience. 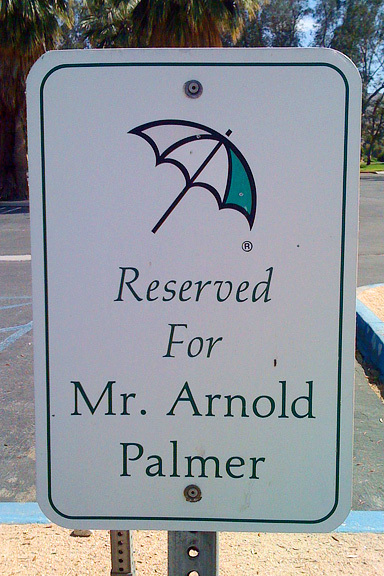 Incidentally, I did not see Arnold Palmer there but I did spot his parking spot. People's respect for The King was most evident — the parking spot was empty — no one wanted to take his parking place. After	Mizuki	and	Pi-chan	were shopped out, we headed to Universal City, home of Universal Studios. It has been a while since I have been to this theme park and found a few surprises. 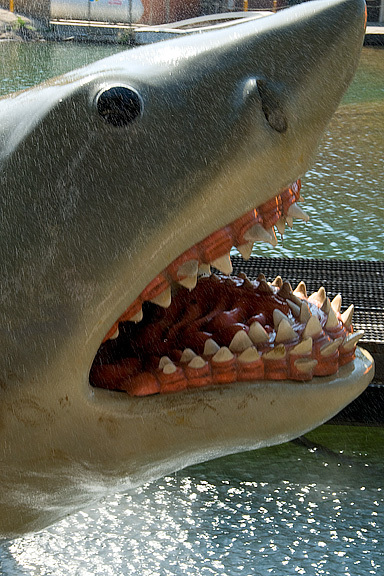 The first is the cost of admission which has skyrocketed to $64! By comparison, Disneyland is charging $47 — and, in my humble option, offers more entertainment value regardless of price. But Pi-chan has visited Tokyo Disneyland many times and wanted to visit Universal Studios — sticker shock notwithstanding. 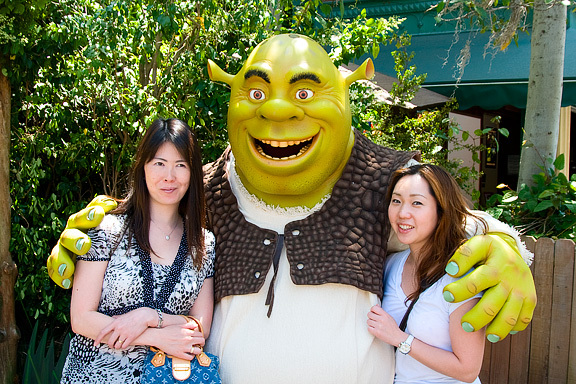 Soon after we entered the park, she encountered Shrek, the green ogre. He stars in the park's Shrek 4-D attraction. What is 4-D you ask? Well, you start with the 3-D glasses, add in seats that move in sync with the movie and a few extras thrown in like sprays of water (I hope it was water) when Shrek sneezed or at other wet places in the film. My first time — it was cute. 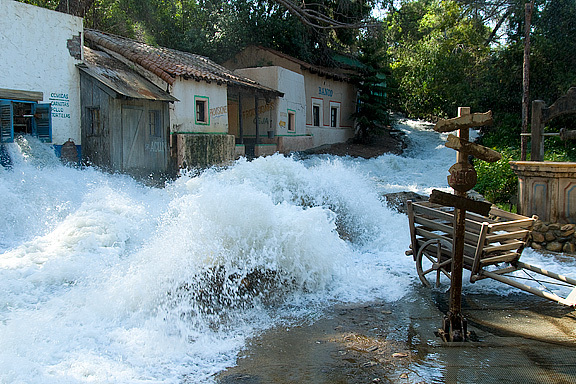 We then visited the Jurassic Park Ride — which is a water ride through what looks like the set from the Jurassic Park movie. At one point, the raft is diverted into the area of the part that was getting out of control — first the Velociraptors pen has been breached then we eventually run into the T. Rex. This was my second time and it still entertains but seems a bit shorter than I recalled. Do take care if you have a nice camera (or anything else that might be damaged by water) — because you and your belongings will get wet. Ask for a bag in the adjacent shop for protection. They also sell ponchos for $3 but unless it is a cold windy day, that really isn't needed. The Revenge of the Mummy	is	a	roller	coaster ride which occupies the same building that formerly housed the E. T. Adventure ride (which featured that lovable Extra-Terrestrial from the Spielberg film). 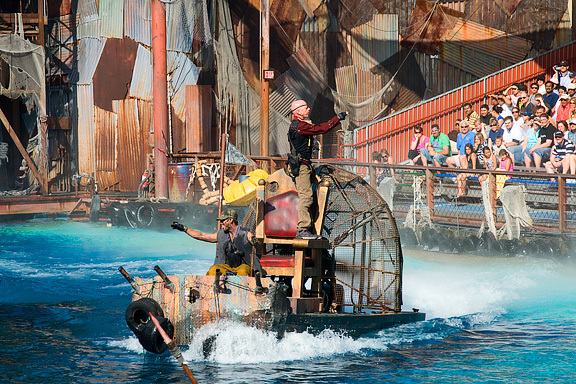 The replacement attraction is fast and furious — and mostly in the dark. It made me think of Space Mountain at Disneyland — although Disney does it better. Incidentally, the E. T. ride is still at Universal Studios in Florida and, curiously, Japan (Pi-chan has not been there yet). 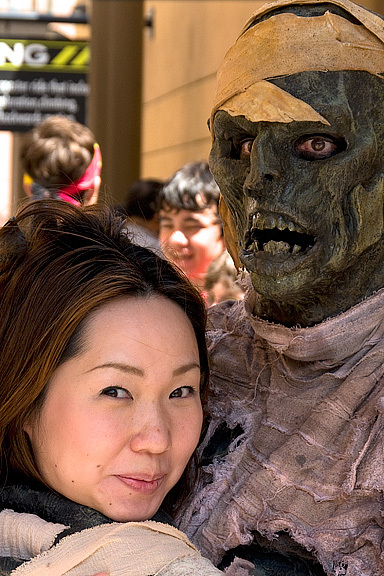 Outside the ride is a very scary-looking mummy guy. That's odd — Pi-chan does not look very scared. They did offer one service outside this ride that I thought was a good idea. They have lockers where you can place your valuables before riding the roller coaster. You obtain a free locker by placing your right index finger on a reader (originally read when you enter the park). Upon exiting the ride, you repeat the process and your locker opens. It seemed to work well but I wondered about the quality of the finger print reader and whether it might sometimes give away your valuables to someone else. Now that would be scary! 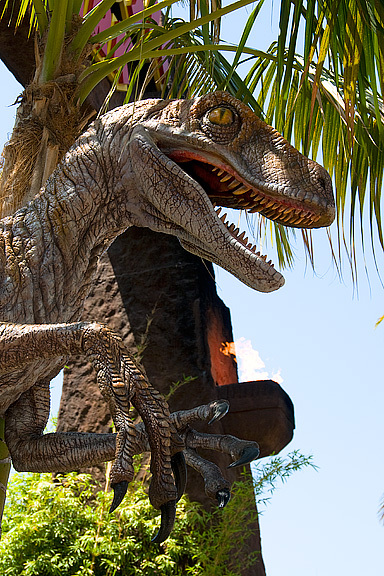 We next did the one attraction that I think "makes" Universal Studios — the Back Lot Tour. At 3:30, they have a special tour with a Japanese-speaking tour guide. Obviously, that was perfect for Mizuki and Pi-chan — and fine with me since I have taken the tour before. 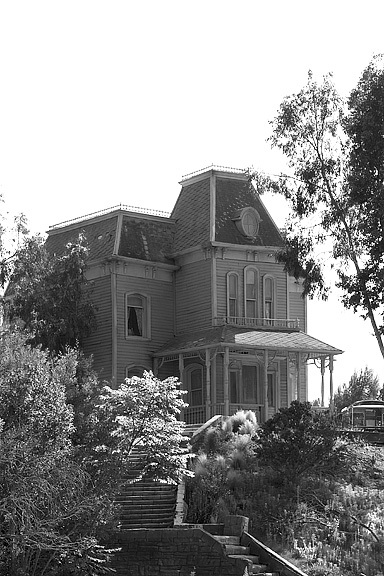 Jaws which surprised Pi-Chan	who	was	on	the right side of the tram followed by the house on the hill from Psycho. Curiously, when we came to that spot in the tour, everything reverted to B&W. I wish they could make it look like nighttime — now that would be scary! 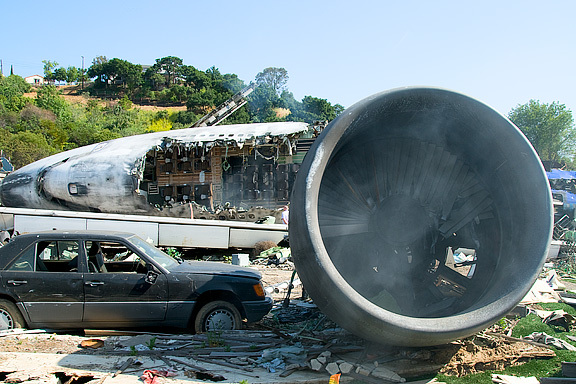 There were some new attractions in the Back Lot	— namely this jumbo jet crash site. Since I could not understand the Japanese tour guide, I cannot give you any details — but it was very realistic looking. 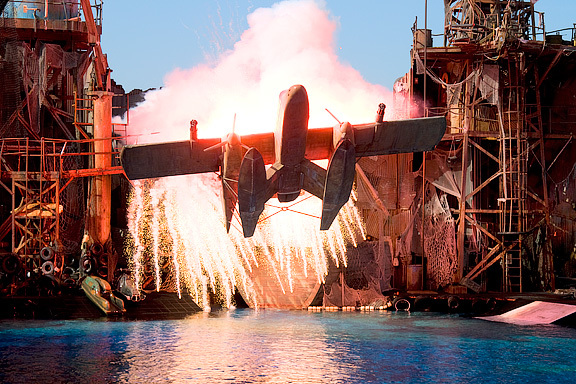 Next on the agenda was the Waterworld show. 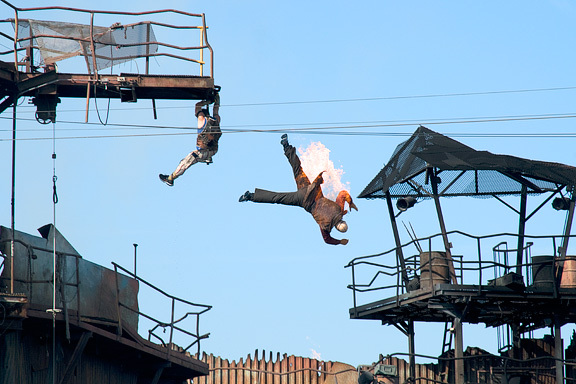 I think that this was originally the Wild West Stunt Show but which has been upgraded to a new genre. 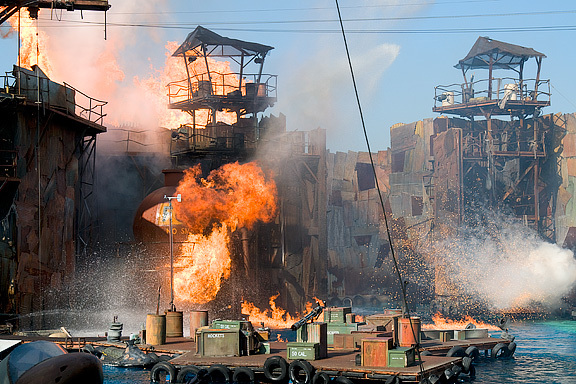 Of course only three people in the entire world have seen the movie but the stunt show works well with the theme. 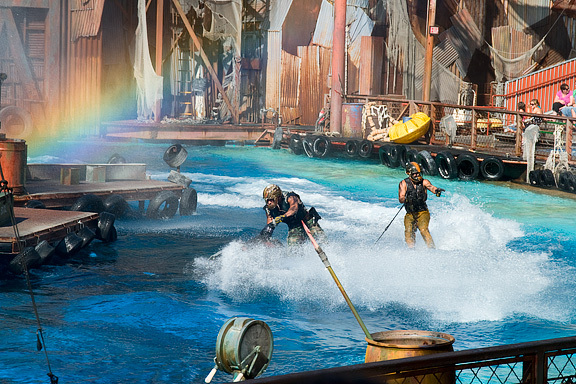 These are the bad guys on grungy jet skis — who delight in spraying water into the audience. The first half dozen rows are marked that you may (read "will") be soaked. Soon after the above, the head bad guy appears. In this future scenario, global warming has melted the ice caps and glaciers so that all land is under water. The heroine has discovered a place that is still above water — and the bad guy wants the information. So the battle is on. Then a surprise — we hear the sound of an aircraft that crash lands into the lagoon. It was awesome — although I cannot remember what it had to do with the story — I'm sure someone will let me know. The battle continues until the good guy defeats the bad guy. Of course the flaming bad guy sets off the big finale's flames and explosions. It was fun and not to be missed if you go to Universal Studios. The park closes at 6:00 PM weekdays (this time of year, at least) so we had time for one last show — Terminator 2: 3-D. It was okay — interesting but very noisy. Outside the theater, is a bike like the one Terminator rode. 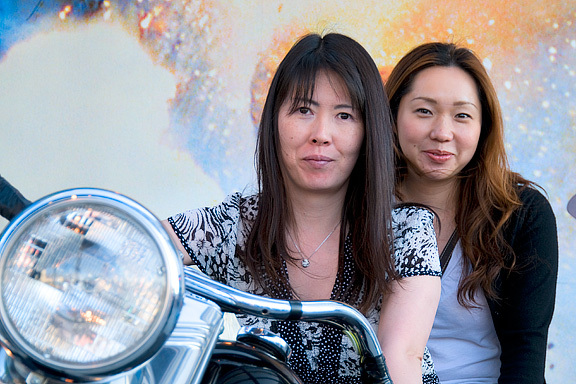 These two bad biker chicks jumped right on and away they went.